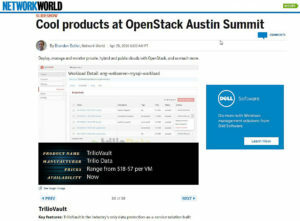 TrilioVault is one of several new products included in the Network World featured slideshow, “Cool Products at OpenStack Summit Austin,” written by Senior Editor Brandon Butler. The piece covers OpenStack products and solutions being announced and showcased at the twice-annual OpenStack Summit, taking place this week in Austin, Texas. ESG’s evaluation of TrilioVault for OpenStack.